Here are two recipes from a new recipe book released by Douglas & McIntyre last spring. It is full of information and inspiration for eating foods that are nutritional powerhouses. They would be relatively quick to prepare for dinner when you get home late and would travel well to school for lunch the next day. Firefighter Ryan Chinbo contributed this distinctive, healthy and juicy offering. He and co-workers at the District of North Vancouver Fire & Rescue, Station #1 in Lynn Valley, BC (some of whom are vegans), frequently prepare vegetarian and vegan dishes. You could add other berries in season—raspberries or strawberries would work well. Ryan cools the quinoa in the freezer while chopping the other ingredients, possibly because the fire bell might start dinging at any moment, so he has to work quickly. How exciting! 1. Cook quinoa in salted water. Bring almost to a boil, then cover the pot and simmer about 20 minutes until quinoa is tender and water is absorbed. 2. Dice cucumber. If using regular cucumber, cut in half and remove seeds first. 3. Peel and remove pith from orange, and dice. 4. Steam kale for 2 to 3 minutes, drain well and finely chop. 5. Place cooled quinoa and all other ingredients except the lemon juice and vinaigrette in a large bowl. Sprinkle lemon juice over all, dress with vinaigrette and toss well. 2. Wash greens and leave leaves wet. Strip the Swiss chard leaves from ribs and separate. Chop ribs into 1/2-inch (1-cm) chunks. Chiffonade or chop Swiss chard and kale leaves together. Set leaves aside. 3. On the stove, heat oil in a good-sized oven-proof skillet with lid, stir-fry diced onion and chopped ribs for about 5 minutes, then spread mixture evenly on bottom of pan. 4. Toss in the still-moist chopped leaves and sprinkle evenly with garlic, chives and thyme. If the leaves are on the dry side, add 1 Tbsp (15 mL) water. Cook long enough to wilt leaves, which should take 5 minutes or less. 5. Meanwhile, mix eggs, milk, salt, pepper and half the nutmeg in a blender. 6. Once the greens are wilted, pour the egg mixture evenly over them. Spread the grated cheese on top and sprinkle the remaining nutmeg evenly over the cheese. 7. Bake uncovered until the centre is solid, about 20 minutes. 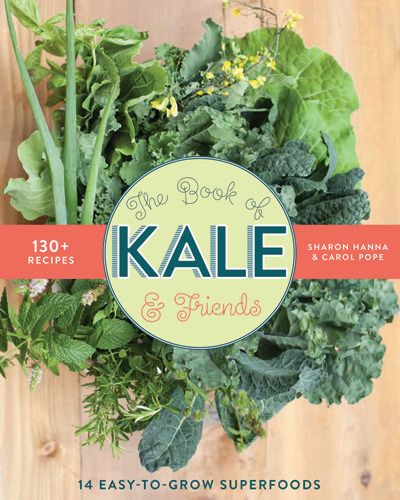 Recipes from The Book of Kale & Friends: 14 Easy-to-Grow Superfoods, by Sharon Hanna & Carol Pope.